I finally figured it out. Or better said, UNLV finally figured it out. Urgency! They’ve lacked it. They found some Wednesday at the Pit vs New Mexico and managed to pull off a very impressive road victory. They lacked urgency for the entire first half of the season. You could see it in the way they played; poorly executed offensive possessions, and a lackadaisical attitude on defense. That wasn’t the case at New Mexico. Fewer bad shot selections, and an intensity we haven’t seen on defense, especially in the second half. The Rebels started out hot. After taking the lead 10-9 early in the first half, the rebels never trailed the rest of the game. In the first five minutes it felt like both teams were scoring at will. The rebels were really able to take over with a 20-3 run when UNM star, Cameron Bairstow went to the bench with early foul trouble. The biggest play of the first half was when Bryce Dejean Jones knocked a pass away and finished with a nasty dunk (AND 1!!). At that point my brother sent me a text, and I’m paraphrasing, “Is this what it was like to watch UNLV in 1991.” I had to tell him to slow down a bit. It was 10 minutes of the first half. A talented, and well-coached team in UNM crawled back, and got to within four points before halftime. The second half was a tug of war. 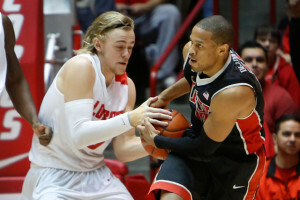 When UNLV would pull ahead by 8 or 9 points, UNM would score on back to back possessions and keep it within 4 points. This pattern would continue late into the game. 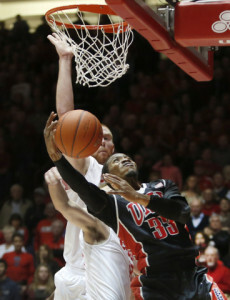 UNM eventually got within one point, but BDJ and Deville Smith came up clutch at the FT line. A desperate, baseline 3-point attempt from Cullen Neil came up short, and UNLV walked away victorious. Dave Rice was very complimentary of Carlos Lopez-Sosa who played his most minutes of the season and did a great job on the defensive end of the floor. Other players who played great were Bryce Dejean Jones (11/13 from the FT), Deville Smith (10 points in the second half), Jelan Kendrick, Khem Birch (11 rebounds, 11 points) and Kevin Olekaibe (4/5 from 3 pointer). What does this win mean for the rest of season? It could mean everything, or it could mean nothing. It all depends on how UNLV responds. They can ride the momentum and turn the season around, or they deflate, and get closer to that NIT bid. They have a great opportunity to continue to resurrect the season if they can pull off another road win Saturday, vs SDSU. We’ll see if they still have that sense of urgency.